JUST HOW far back the union between man and woman goes is difficult to tell. What is certain is that the idea of marriage and the traditions that go along with it continue to evolve.According to Jacks (2004), the concept of marriage evolved as nomadic peoples gave way to settled agricultural, trading communities, where people could come together more easily. Weddings came to be seen as having a stabilising effect on society. Men were “thought to be calmer with a wife and children, women were thought to be less troublesome with a husband, and children better off with a mother and father they knew and trusted. The kinship between families and clans brought together through the weddings also was seen as a necessity to prevent serious feuding and the breakdown of civil order” (retrieve at http://www.singlescafe. net/history-of-weddings.html). Jacks (2004) goes on to explain that the idea of an engagement period was introduced in Ancient Egypt as a time for the betrothed couple to become acquainted. He gives examples of marriage traditions through the ages, noting, for example, that in Ancient Rome, men who put off their wedding day were penalised, brides had to be at least 12 and grooms, 13 years old, and slaves were not permitted to marry. In Ancient Japan, a ‘Nakado’ (go-between) made marriage arrangements between families. Viking weddings were loud, rambunctious affairs at which guests received gifts. also take fire from their hearths to the home of the newlyweds and light new fire to signify a new beginning (www.world-wedding-traditions-net). Today most Jamaican weddings resemble weddings in western countries, borrowing mainly from American and English practices. Yet, they are noted (like French West Indian weddings) for the traditional rum/fruit cake served to guests and occasionally frozen for serving on the first anniversary. In the past, following Emancipation (slaves were not allowed to formally wed), the cake played a much larger role. Old time country weddings were marked by “cake parades” the day prior to the actual ceremony or on the day itself. In this they show some similarity to Scottish weddings, which involved large, elaborate processions. 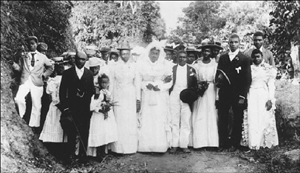 Old time Jamaican country weddings were also characterised by “wedden godmaddas and godfaddas” who were chosen by the bride and groom respectively. In this they showed similarity to many African traditions that involved family and community in the planning and celebration. These godparents planned the entire wedding, collecting funds from parents and relatives on each side and selecting volunteers. Both godparents accompanied the couple to choose their rings but they also had distinct individual tasks. According to Miss Lou in a 1981 Skywritings article, the ‘wedden godmadda’ helped the bride to choose her gown, her bridesmaids and their dresses. Sometimes she made the bridal gown herself. She also dressed the bride on the wedding day and provided the bouquet. These dresses usually reflected latest trends ­ there were no restrictions on styles although the brides tended to wear satin and lace. The ‘godmadda’ also arranged the cakes and the cake procession and decorated the ‘wedden table’ with ferns, colourful wild flowers like bougainvillea, and seasonal fruits. Women also prepared food for the builders and juiced cane for the wedding reception. In this 1981 Skywritings article, Miss Lou went on to carefully chronicle the events of a traditional wedding day. Beginning with the ‘wedden godmadda’, who she said rose early and dressed on the wedding morning, making sure to include a starched white apron and colourful bandana-plaid head tie. The ‘godmadda’ then checked on the church decorations and returned to see to the bride who had to include one or two leaves of sweet basil in her shoes or stockings for good luck. 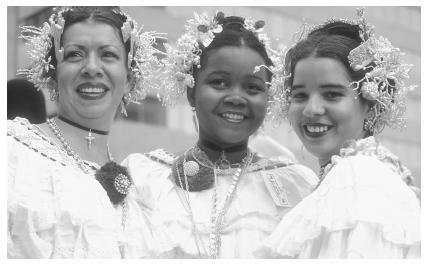 Then came one of the highlights of the festivities ­ the ‘wedden godmadda’ arranged the cake procession (if it had not occurred the day before) which consisted of young, single women she had chosen and dressed in white, lined up in twos. The shortest girl walked alone in front and the tallest, alone in back. to the ‘wedden booth’, singing and chanting ‘there’s a wedden here today….’ Villagers and invited guests joined the procession. When they reached the reception yard, the cake carriers placed their cakes on the wedding table and stayed in the “wedden booth” singing until the “wedden godmadda” returned from the church, where she traditionally accompanied the groom. The bride was escorted by the “wedden godofadda” and the bridal party ­ all often on horseback. When the bride and groom arrived at the reception, congratulations and blessings were showered down on them as they were escorted to the head of the “wedden table.” The “wedden godfadda” would then start one of the most exciting parts of the reception ­ the “bidding ceremony” for the unveiling of the wedding cake. With each bid to hasten the unveiling, bidders would walk up to place money in the “bidding plate”. The amount placed did not often correlate with the amount bid ­ everyone came prepared to give what they could afford. When the “wedden godmadda” felt the bidding plate held enough to give the newly-married couple a good start in life, she would cry out, “I bid that this beautiful cake be unveiled!” Two of the cake bearers would then cut the bottom tier ­ the one who finished first was the one slated to marry next. The first piece of the traditional rum/fruit cake was given to the bridal couple to share as the speeches began. The speeches could take a long time and tended to be flattering and flowery. Dancing followed, often to the sounds of a mento band or fiddler. During the dancing, the “wedden godfadda” cut the “show bread.” Each bachelor was expected to buy a slice and present it to the girl he most fancied. The newly-weds got this money, too, as ‘brawta’ (extra). Dinner, Miss Lou stated, came next ­ mannish water, curry goat and rice, roast breadfruit, chicken and rice and peas, roast yam, boiled banana and run-dung. To drink ­ cane liquor, rum, wine and ginger beer. The ‘wedden godmadda’ then busied herself amidst much clapping and cheering of the bridal couple, preparing baskets of the best food for the newly-weds to take with them when they left. Both godparents traditionally ended the evening by escorting the newly-weds to their new home. But their work was not done. SOURCES: Bennett, L. (2003). “Old-Time Jamaican country ‘wedden'” in Gambrill, L. (Ed.) (2003). A Tapestry of Jamaica: The Best of Skywritings. (pp. 79-81). Kingston: Macmillan Caribbean, Jacks, M. (2004). The History of weddings: Tying the knot through the ages. 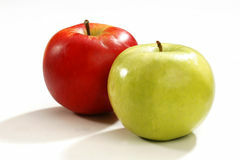 Online at http://www.singlescafe.net/history-of-weddings.html, Senior, O. (2003). The Encyclopedia of Jamaican Heritage. Kingston: Twin Guinep Publishers, (pp.510-511), http://www.world-wedding-traditions.net, http://www.titanium-wedding-rings-and-bands.com/A-History-of-Weddings.html. An old-time wedding near Content College, St. Andrew, in the early 1900s. This entry was posted in History and tagged and with your hands, Old-time Jamaican weddings Now join your hands, your hearts ­Shakespeare. Bookmark the permalink. ← In this place dwelt Horatio Nelson: WHO WAS Horatio Nelson?